There was probably a time when the desire to name your offspring "Eucalyptus" or "Nutritional Yeast" was an indicator that perhaps you should not be bringing new life into this world. That said, 2018's been a weird year. And apparently, naming your children after niche salad ingredients is yet another symptom of the times. 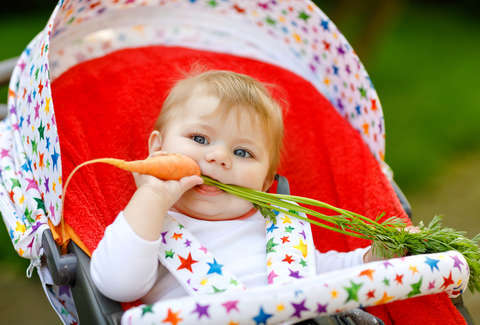 According to a study on trending baby names revealed earlier this week by BabyCenter, "names connected with mindfulness and food are on the rise." The online pregnancy and parenting hub declared that names like Sophia and Jackson remain en vogue -- but as of this year, they're sharing their ranks with the likes of Kale, Maple, and Saffron. "Parents are inspired by the things they love as well as the sound of a name," BabyCenter's Senior Vice President of Consumer Experience Linda Murray explained in a press release. "Millennial and Gen Z moms and dads found name inspiration in their passions and values in 2018. The names they chose evoke wildly varied topics, such as peace and spirituality, foods and flavors, the second Kardashian generation, and the online game Fortnite." What a time to be alive. BabyCenter's data claims that the name, Kiwi is up 40% in popularity since 2017, while Clementine is up 15%. In the Fortnite realm, Leviathan went up 46%, and Rogue went up 47%. We've also seen significant spike in Rainbow, Ocean, Stormi, Saint, and Magnolia, which is a confusing concoction of questionable cultural references. Can you imagine looking at a swaddled baby boy, and thinking ​​look at him drool, he's definitely a Leviathan? Well that is, in fact, a feeling that functional human adults are having. Fortunately, BabyCenter offers some resources if you're feeling like your prospective baby names are just too damn vanilla. Not only do they provide an app that functions as some sort of Tinder for baby names, but they ​​​​​​​also have a handy list of suggestions for folks hoping to pay homage to Sweetgreen on their children's birth certificates. On this year's roster of food and drink-related name suggestions, you'll find Alfredo, Dijon, Chianti, and Fig. In 2019, we're predicting a rise in Soylent, Adderall, and Jackfruit. The future is full of promise. Eliza Dumais is a news writer at Thrillist who will probably name her child Frosted Flake. Follow her on Twitter for proof.